Last Updated: April 17, 2019 · Published: April 3, 2018 By: Asian Caucasian Leave a Comment This post may contain affiliate links or sponsored content. Please kill me if I make a stupid “egg” pun! 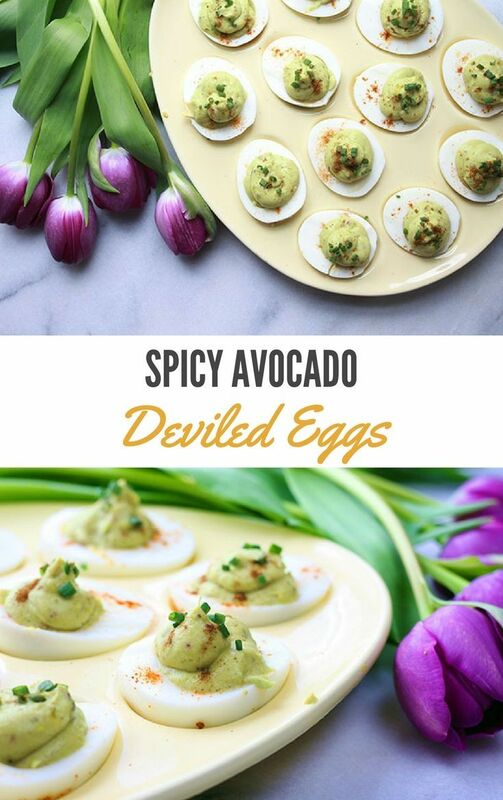 OK, just one… these Spicy Avocado Deviled Eggs are “egg-ceptionally” tasty! OK, done. 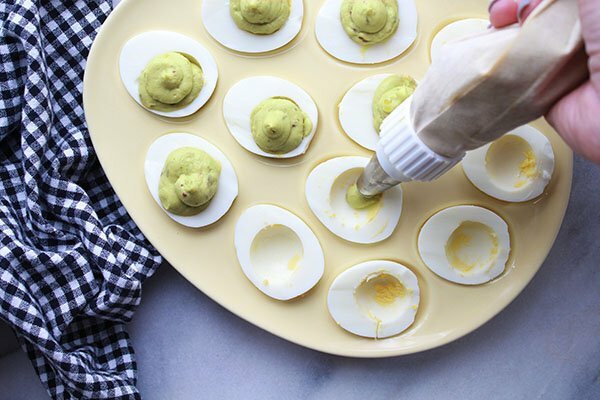 But really, these are so easy to make and are not your ordinary deviled eggs. 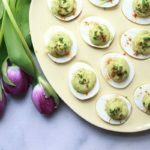 If you have any leftover Easter or Passover hard boiled eggs, you need to make this recipe because you’ll want to take these to your next picnic for sure! They are made with egg yolks and avocados, are super creamy from the Greek yogurt, and have a nice kick from the sambal oelek (Thai red chili paste). You can substitute this with sriracha sauce if you’d like. There’s no mayo in these babies so these deviled eggs are also very healthy. Great low-cal way to get in your protein! I bought a cute deviled egg tray at TJ Maxx which makes them look so decorative. How many of these deviled eggs would you eat? Honestly, I think I could eat half the tray! 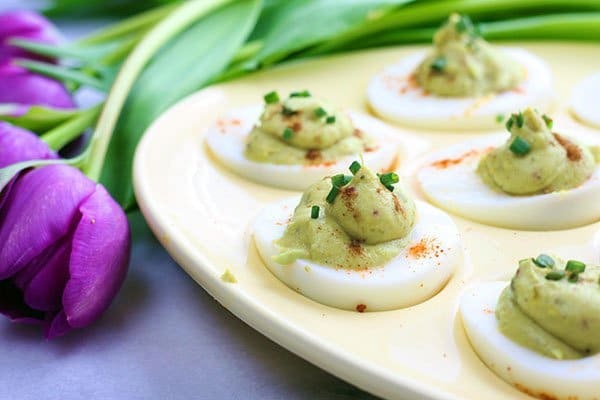 The avocados make these deviled eggs so creamy! So does the touch of Greek yogurt. But the spicy kick is in the sambal oelek (Thai chili paste)! I used large, organic brown eggs for these Spicy Avocado Deviled Eggs. The taste does make a difference and the yolks are bright yellow, like sunshine! To make the deviled eggs filling super creamy, use a hand blender to mix all the ingredients. Once blended, use a piping bag with tip to pipe the filling into the egg whites. Top these yummy Spicy Avocado Deviled Eggs with finely chopped chives and sprinkles of cayenne pepper. 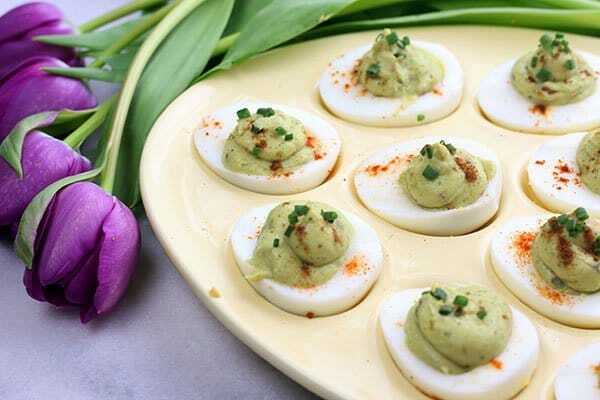 These Spicy Avocado Deviled Eggs are so easy to make and are not your ordinary deviled eggs. 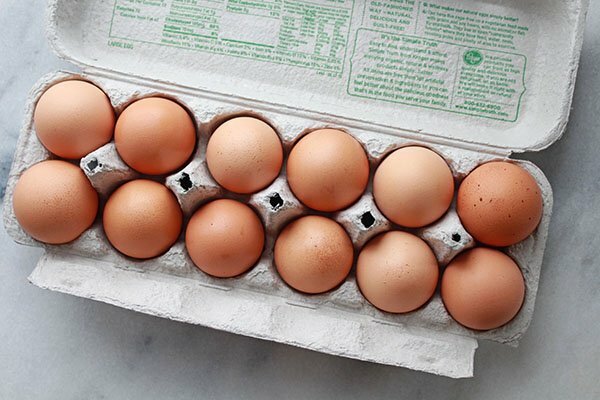 Cut the eggs in half lengthwise. Remove the yolks and place in a mixing bowl. Remove the pits and skin from the avocados and add to the bowl. Add in the yogurt, lime juice, salt and pepper. 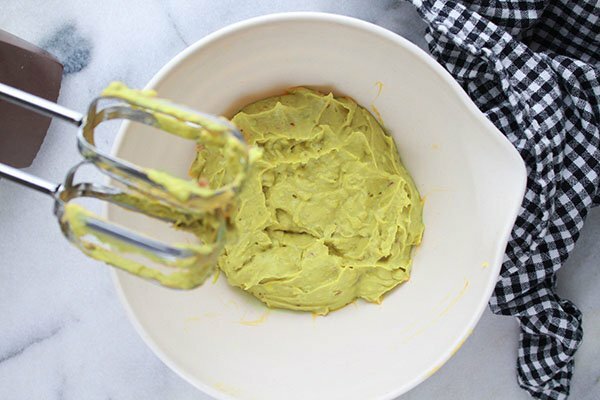 Using a hand-held mixer, beat the ingredients until smooth and creamy. Taste for extra seasoning if necessary. Use a pastry bag to pipe the mixture into each egg white and garnish tops with chopped chives and sprinkles of cayenne pepper. 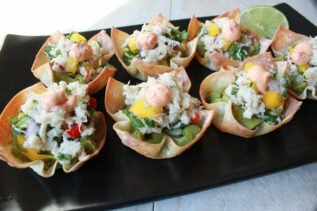 If you liked this recipe, try our Spicy Crab Salad & Guacamole Wonton Cups.